Salvinorin B methoxymethyl ether (2-O-methoxymethylsalvinorin B) is a semi-synthetic analogue of the natural product salvinorin A which is used in scientific research. It has a longer duration of action of around 2–3 hours, compared to less than 30 minutes for salvinorin A, and has increased affinity and potency at the κ-opioid receptor. Like the related compound herkinorin, salvinorin B methoxymethyl ether is made from salvinorin B, which is most conveniently made from salvinorin A by deacetylation, as while both salvinorin A and salvinorin B are found in the plant Salvia divinorum, salvinorin A is present in larger quantities. 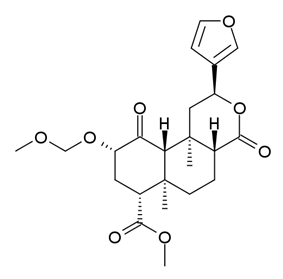 Salvinorin B methoxymethyl ether has a Ki of 0.60 nM at the κ opioid receptor, and is around 5x more potent than Salvinorin A in animal studies, although it is still only half as potent as its stronger homologue Salvinorin B ethoxymethyl ether. ^ Inan S, Lee DY, Liu-Chen LY, Cowan A (March 2009). "Comparison of the diuretic effects of chemically diverse kappa opioid agonists in rats: nalfurafine, U50,488H, and salvinorin A". Naunyn-Schmiedeberg's Archives of Pharmacology 379 (3): 263–70. ^ McLennan GP, Kiss A, Miyatake M, Belcheva MM, Chambers KT, Pozek JJ, Mohabbat Y, Moyer RA, Bohn LM, Coscia CJ (December 2008). "Kappa opioids promote the proliferation of astrocytes via Gbetagamma and beta-arrestin 2-dependent MAPK-mediated pathways". Journal of Neurochemistry 107 (6): 1753–65. ^ Wang Y, Chen Y, Xu W, Lee DY, Ma Z, Rawls SM, Cowan A, Liu-Chen LY (March 2008). "2-Methoxymethyl-salvinorin B is a potent kappa opioid receptor agonist with longer lasting action in vivo than salvinorin A". The Journal of Pharmacology and Experimental Therapeutics 324 (3): 1073–83.